Welcome to Our home and we love to meet you. You stay in many cities in stonrooms & Buildings and heritage property. 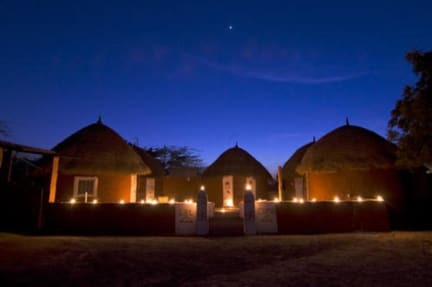 But we have for you traditional hut accommodation this is very interesting for you. You will sleep in hut. Stay with family and more fun. Salawas is a small village 20 kilometers from Jodhpur where there are many men and women dressed in traditional Rajasthani attire. Chhota Ram Prajapats home stay is a very peaceful place in Salawas village. 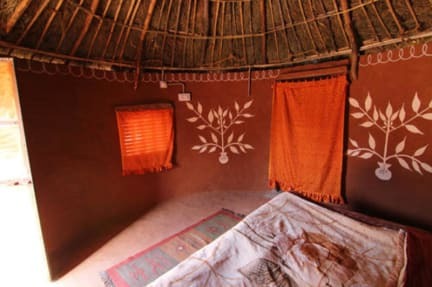 At Prajapats home stay, you will be sleeping in traditional simple hut accommodation in the village of Salawas which is atteched bathrooms running cold and hot water. You will enjoy your experience at Chhotaram Prajapats home stay and it will be very memorable. You will be able to walk through the village and cycle in the countryside which can be arranged by the family of Chhota Ram Prajapat . Guest come as a tourist, live as a family and go as a friend. Bishnoi Village safari arrange by family of chhotaram Prajapat that is very interesting by open jeep. Have traditional rajasthani meal at prajapat's home with family.